Cardoons are a thistley sort of vegetables, and an exotick plant, and are managed in the garden as celery or endives, by being mouldred [mounded] up as they grow in height to make them white. The French make use of this in some sort of sauces in the first course dishes instead of celery, &c. But for an entremets, or second-course dish, they generally do it in the following manner: One large one is enough for a small dish; cut the white part only in pieces about two inches long, blanch it in water, and if you have a braize tie it up, and stew it very tender in that; if not take broth, season it high and stew it in that; take it out upon a cloth, and pull off the skin on both sides, and put it into a sauce piquant, as before mentioned; let stew softly twenty minutes or half an hour, squeeze in the juice of a lemon or orange, and dish it up. This> is very good sauce for roast beef or mutton. This is a plant of our own, and grows common upon dry banks and barren ground, but worth nothing for this use till improved by the gardener, which is done by transplanting, and earthing up to whiten, and when peeled, and brought to market, looks more like fine endive than a common thistle. The English always plain boil it, and have butter only for sauce; but foreigners with the sauce above or a brown sauce of cullis or gravy; boil it in a little broth, pepper and salt, but not tender; pour that from it, and put your white sauce, let stew a few minutes, squeeze in an orange or lemon, and dish it up. 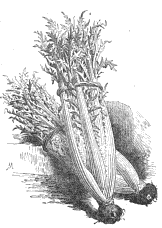 Whole heads of celery and endives are often done in the same way for these extremets; and most foreigners eat heartily of them. Des artichaux marinez and frits. Trim them to the sound part of the bottom, and cut off the small leaves round, cut the points of the others to about an inch above the bottom, cut them in small pieces, and take out the choke or seedy part, lay them to soak in a marinade of white wine and vinegar, &c. often moving them; prepare a batter of beer and butter, dry them well, and fry all at once, and fend them up upon a heap of fry'd parsley. Fry sometimes with flour sticking to the marinade, and sometimes without any. Bottoms of artichokes, with a brown sauce. Des queues d' artichaux, sauce brune. Cut off all the black and soil from the bottom, trim round the sides, but not through the heart of the leaves, cut off the tops of the leaves almost to the bottom, so as to leave a hollow; when your choke is taken out, boil them in water till you find the inside, put them into cold water, and with your finger scrape it out to make 'em white and tender; prepare a hot marinade of boiling water, a lump of butter and flour mixt, a bit of sewet, a lemon peeled and sliced in a little salt, an onion and a bunch of herbs; a little a little soup-pot is best for this; when it is well mixt and boils, put in your bottoms, and let them simmer sideways till very tender, and they will grow white as a curd; for your sauce take a ladle of cullis, and add to it such sorts of herbs as you like, pepper, salt and nutmeg; boil all a little while, take out the bottoms upon a cloth to drain, dim then up, squeeze the juice of an orange or lemon into your sauce, and send to table. Here seems to be a vast deal said upon such a trifling matter; but I have been in hundreds of kitchens where there never was a cook that could cut an artichoke-bottom genteelly, or make it white; and there cannot be a prettier dish; and you may serve them to table with a white sauce of any sort, or with plain butter only.